They have spawned 112 episodes of stop-motion TV content, a live-action movie, a successful music career, and the nickname for a defunct football club, but since 1998 classic British franchise The Wombles (started as a book series in the 1960′s by Elizabeth Beresford) have been pretty quiet. 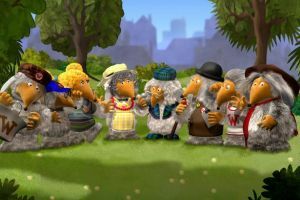 Until now that is, the format will be making a return to screens in 2015, with digital terrestrial broadcaster Channel 5 announcing that they have signed a deal for a new series of The Wombles through their long-running children’s TV programming block Milkshake. The order of 52 episodes (with length currently unconfirmed) might not please some more traditional fans of the first series, though, as the show will be produced by Dramatico Animation Ltd., who intend to create the show in CGI, an easier and more professional-looking method, but lacking the charm that the original 70′s version will have held in nostalgic viewers of the historic BBC series. The series, based around a fictional species (with characters often named after places and locations) and a group of them that live underground at Wimbledon Common in London (England), making it their aim to creatively reuse everyday litter, themes carried through the novels, the two original series on BBC and ITV (1973-75 & 1997-98, respectively), the movie, and its band. Tabloid Newspaper Owner To Buy Channel Five And Return To Project Canvas? Elizabeth on Amazon TV Coming Soon?